Something like over half of the messages have at least one animated emoji in the subject. None of my friends would use that crap. No valid company that I'd do business with would ever do that either. How can I create a filter to, perhaps, auto-delete messages with animated emoji in the subject? Using jamesmstone's clue below, I tried a search with subject:=?UTF-8? and subject:"=?UTF-8?" and several other permutations, but none worked. Instead of using Gmail Filters that depends on the Gmail search feature to search for the encoded emojis in the orignal messages, create a script using the GmailMessage::getRawContent() method of Google Apps Script to process the messages. The following are links to answers to similar questions in this site including scripts using the referred method. How to setup Gmail filters based on information in the header?, answered Jul 24 '15 at 6:07. Is it possible to create a Gmail filter that works on headers other than From, To, Subject?, answered Feb 4 '15 at 20:28. I have created a Google Apps Script for such purposes. It lets you create all sorts of advanced rules that you can match against your spam message folder, so messages that are definitely spam will be cleaned up automatically. This is not quite what you are asking for (filtering out the emojis themselves rather than the messages with emojis) but you may find some of the content useful for building a better message filter. 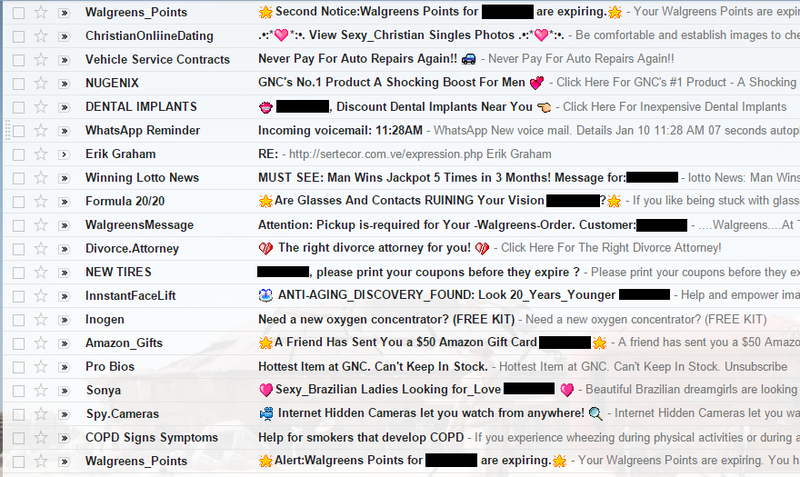 Unicode cockroaches: There are still many many emoji (and other Unicode sequences generating pictures) that spammers and other erstwhile marketers are starting to use in email subject lines and that gmail does not convert to HTML images. In some browsers these show up bold and colored, which is almost as bad as animation. Browsers could also choose to animate these, but I don't know if any do. These Unicode sequences get displayed by the browser as Unicode text, so the exact appearance (color or not, animated or not, ...) depends on what text rendering system the browser is using. The appearance of a given Unicode emoji also depends on any Unicode variation selectors and emoji modifiers that appear near it in the Unicode code point sequence. Unlike the image-based emoji spam, these sequences can be copied-and-pasted out of the browser and into other apps as Unicode text. Not the answer you're looking for? Browse other questions tagged gmail gmail-filters emoji or ask your own question. Gmail grouping messages with the same subject? How can I turn off or hide animated emoji icons in subject lines in Gmail?